"Wien" redirects here. For other uses, see Wien (disambiguation). This article is about the capital of Austria. For other uses, see Vienna (disambiguation). Vienna (/viˈɛnə/ ( listen); German: Wien [viːn] ( listen)) is the federal capital and largest city of Austria, and one of the nine states of Austria. Vienna is Austria's primate city, with a population of about 1.9 million (2.6 million within the metropolitan area, nearly one third of Austria's population), and its cultural, economic, and political centre. It is the 7th-largest city by population within city limits in the European Union. Until the beginning of the 20th century, it was the largest German-speaking city in the world, and before the splitting of the Austro-Hungarian Empire in World War I, the city had 2 million inhabitants. Today, it has the second largest number of German speakers after Berlin. Vienna is host to many major international organizations, including the United Nations and OPEC. The city is located in the eastern part of Austria and is close to the borders of the Czech Republic, Slovakia, and Hungary. 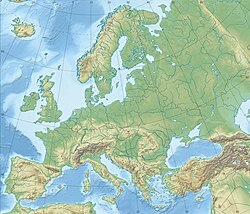 These regions work together in a European Centrope border region. Along with nearby Bratislava, Vienna forms a metropolitan region with 3 million inhabitants. In 2001, the city centre was designated a UNESCO World Heritage Site. In July 2017 it was moved to the list of World Heritage in Danger. Apart from being regarded as the City of Music because of its musical legacy, Vienna is also said to be "The City of Dreams" because it was home to the world's first psychoanalyst – Sigmund Freud. The city's roots lie in early Celtic and Roman settlements that transformed into a Medieval and Baroque city, and then the capital of the Austro-Hungarian Empire. It is well known for having played an essential role as a leading European music centre, from the great age of Viennese Classicism through the early part of the 20th century. The historic centre of Vienna is rich in architectural ensembles, including Baroque castles and gardens, and the late-19th-century Ringstraße lined with grand buildings, monuments and parks. Vienna is known for its high quality of life. In a 2005 study of 127 world cities, the Economist Intelligence Unit ranked the city first (in a tie with Vancouver and San Francisco) for the world's most liveable cities. Between 2011 and 2015, Vienna was ranked second, behind Melbourne. In 2018, it replaced Melbourne as the number one spot. For ten consecutive years (2009–2019), the human-resource-consulting firm Mercer ranked Vienna first in its annual "Quality of Living" survey of hundreds of cities around the world. Monocle's 2015 "Quality of Life Survey" ranked Vienna second on a list of the top 25 cities in the world "to make a base within." The UN-Habitat classified Vienna as the most prosperous city in the world in 2012/2013. The city was ranked 1st globally for its culture of innovation in 2007 and 2008, and sixth globally (out of 256 cities) in the 2014 Innovation Cities Index, which analyzed 162 indicators in covering three areas: culture, infrastructure, and markets. Vienna regularly hosts urban planning conferences and is often used as a case study by urban planners. Between 2005 and 2010, Vienna was the world's number-one destination for international congresses and conventions. It attracts over 6.8 million tourists a year. The English name Vienna is borrowed from the homonymous Italian version of the city's name or the French Vienne. The etymology of the city's name is still subject to scholarly dispute. Some claim that the name comes from Vedunia, meaning "forest stream", which subsequently produced the Old High German Uuenia (Wenia in modern writing), the New High German Wien and its dialectal variant Wean. Others believe that the name comes from the Roman settlement name of Celtic extraction Vindobona, probably meaning "fair village, white settlement" from Celtic roots, vindo-, meaning "bright" or "fair" – as in the Irish fionn and the Welsh gwyn –, and -bona "village, settlement". The Celtic word Vindos may reflect a widespread prehistorical cult of Vindos, a Celtic God. A variant of this Celtic name could be preserved in the Czech, Slovak and Polish names of the city (Vídeň, Viedeň and Wiedeń respectively) and in that of the city's district Wieden. The name of the city in Hungarian (Bécs), Serbo-Croatian (Beč) and Ottoman Turkish (Beç) has a different, probably Slavonic origin, and originally referred to an Avar fort in the area. Slovene-speakers call the city Dunaj, which in other Central European Slavic languages means the Danube River, on which the city stands. Evidence has been found[by whom?] of continuous habitation in the Vienna area since 500 BC, when Celts settled the site on the Danube River. In 15 BC the Romans fortified the frontier city they called Vindobona to guard the empire against Germanic tribes to the north. Close ties with other Celtic peoples continued through the ages. The Irish monk Saint Colman (or Koloman, Irish Colmán, derived from colm "dove") is buried in Melk Abbey and Saint Fergil (Virgil the Geometer) served as Bishop of Salzburg for forty years. Irish Benedictines founded twelfth-century monastic settlements. Evidence of these ties persists in the form of Vienna's great Schottenstift monastery (Scots Abbey), once home to many Irish monks. In 976 Leopold I of Babenberg became count of the Eastern March, a 60-mile district centering on the Danube on the eastern frontier of Bavaria. This initial district grew into the duchy of Austria. Each succeeding Babenberg ruler expanded the march east along the Danube, eventually encompassing Vienna and the lands immediately east. In 1145 Duke Henry II Jasomirgott moved the Babenberg family residence from Klosterneuburg in Lower Austria to Vienna. From that time, Vienna remained the center of the Babenberg dynasty. In 1440 Vienna became the resident city of the Habsburg dynasty. It eventually grew to become the de facto capital of the Holy Roman Empire (800–1806) in 1437 and a cultural centre for arts and science, music and fine cuisine. Hungary occupied the city between 1485 and 1490. In the 16th and 17th centuries Christian forces stopped Ottoman armies twice outside Vienna (see Siege of Vienna, 1529 and Battle of Vienna, 1683). A plague epidemic ravaged Vienna in 1679, killing nearly a third of its population. In 1804, during the Napoleonic Wars, Vienna became the capital of the newly-formed Austrian Empire. The city continued to play a major role in European and world politics, including hosting the Congress of Vienna in 1814/15. After the Austro-Hungarian Compromise of 1867, Vienna remained the capital of what became the Austro-Hungarian Empire. 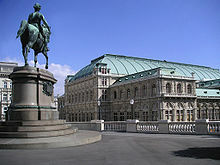 The city functioned as a centre of classical music, for which the title of the First Viennese School (Haydn/Mozart/Beethoven) is sometimes applied. 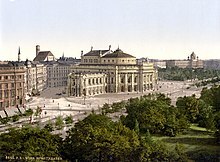 During the latter half of the 19th century, Vienna developed what had previously been the bastions and glacis into the Ringstraße, a new boulevard surrounding the historical town and a major prestige project. Former suburbs were incorporated, and the city of Vienna grew dramatically. In 1918, after World War I, Vienna became capital of the Republic of German-Austria, and then in 1919 of the First Republic of Austria. From the late-19th century to 1938 the city remained a centre of high culture and of modernism. A world capital of music, Vienna played host to composers such as Brahms, Bruckner, Mahler and Richard Strauss. The city's cultural contributions in the first half of the 20th century included, among many, the Vienna Secession movement in art, psychoanalysis, the Second Viennese School (Schoenberg and co.), the architecture of Adolf Loos and the philosophy of Ludwig Wittgenstein and the Vienna Circle. In 1913 Adolf Hitler, Leon Trotsky, Joseph Tito, Sigmund Freud and Joseph Stalin all lived within a few miles of each other in central Vienna, some of them becoming regulars at the same coffeehouses. Austrians came to regard Vienna as a centre of socialist politics, sometimes referred to as "Red Vienna". In the Austrian Civil War of 1934 Chancellor Engelbert Dollfuss sent the Austrian Army to shell civilian housing occupied by the socialist militia. In 1938, after a triumphant entry into Austria, Austrian-born Adolf Hitler spoke to the Austrian Germans from the balcony of the Neue Burg, a part of the Hofburg at the Heldenplatz. Viennese Jews were looted, deported and murdered. Between 1938 (after the Anschluss) and the end of the Second World War, Vienna lost its status as a capital to Berlin as Austria ceased to exist and became a part of Nazi Germany. It was not until 1955 that Austria regained full sovereignty. On 2 April 1945, the Soviets launched the Vienna Offensive against the Germans holding the city and besieged it. British and American air raids and artillery duels between the SS and Wehrmacht and the Red Army crippled infrastructure, such as tram services and water and power distribution, and destroyed or damaged thousands of public and private buildings. Vienna fell eleven days later. Austria was separated from Germany, and Vienna was restored as the republic's capital city, but the Soviet hold on the city remained until 1955. After the war, Vienna was part of Soviet-occupied Eastern Austria until September 1945. As in Berlin, Vienna in September 1945 was divided into sectors by the four powers: the US, the UK, France and the Soviet Union and supervised by an Allied Commission. The four-power occupation of Vienna differed in one key respect from that of Berlin: the central area of the city, known as the first district, constituted an international zone in which the four powers alternated control on a monthly basis. The control was policed by the four powers on a de facto day-to-day basis, the famous "four soldiers in a jeep" method. The Berlin Blockade of 1948 raised Western concerns that the Soviets might repeat the blockade in Vienna. The matter was raised in the UK House of Commons by MP Anthony Nutting, who asked: "What plans have the Government for dealing with a similar situation in Vienna? Vienna is in exactly a similar position to Berlin." There was a lack of airfields in the Western sectors, and authorities drafted contingency plans to deal with such a blockade. Plans included the laying down of metal landing mats at Schönbrunn. The Soviets did not blockade the city. The Potsdam Agreement included written rights of land access to the western sectors, whereas no such written guarantees had covered the western sectors of Berlin. Also, there was no precipitating event to cause a blockade in Vienna. (In Berlin, the Western powers had introduced a new currency in early 1948 to economically freeze out the Soviets.) During the 10 years of the four-power occupation, Vienna became a hotbed for international espionage between the Western and Eastern blocs. In the wake of the Berlin Blockade, the Cold War in Vienna took on a different dynamic. While accepting that Germany and Berlin would be divided, the Soviets had decided against allowing the same state of affairs to arise in Austria and Vienna. Here, the Soviet forces controlled districts 2, 4, 10, 20, 21 and 22 and all areas incorporated into Vienna in 1938. They put up barbed wire fences around the perimeter of West Berlin in 1953, but not in Vienna. By 1955, the Soviets, by signing the Austrian State Treaty, agreed to relinquish their occupation zones in Eastern Austria as well as their sector in Vienna. In exchange they required that Austria declare its permanent neutrality after the allied powers had left the country. Thus they ensured that Austria would not be a member of NATO and that NATO forces would therefore not have direct communications between Italy and West Germany. The atmosphere of four-power Vienna is the background for Graham Greene's screenplay for the film The Third Man (1949). Later he adapted the screenplay as a novel and published it. Occupied Vienna is also depicted in the Philip Kerr novel, A German Requiem. The four-power control of Vienna lasted until the Austrian State Treaty was signed in May 1955. That year, after years of reconstruction and restoration, the State Opera and the Burgtheater, both on the Ringstraße, reopened to the public. The Soviet Union signed the State Treaty only after having been provided with the political guarantee by the federal government to declare Austria's neutrality after the withdrawal of the allied troops. This law of neutrality, passed in late October 1955 (and not the State Treaty itself), ensured that modern Austria would align with neither NATO nor the Soviet bloc, and is considered one of the reasons for Austria's late entry into the European Union. 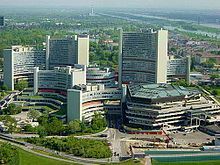 In the 1970s, Austrian Chancellor Bruno Kreisky inaugurated the Vienna International Centre, a new area of the city created to host international institutions. Vienna has regained much of its former international stature by hosting international organizations, such as the United Nations (United Nations Industrial Development Organization, United Nations Office at Vienna and United Nations Office on Drugs and Crime), the Preparatory Commission for the Comprehensive Nuclear-Test-Ban Treaty Organization, the International Atomic Energy Agency, the Organization of Petroleum Exporting Countries, and the Organization for Security and Cooperation in Europe. Because of the industrialization and migration from other parts of the Empire, the population of Vienna increased sharply during its time as the capital of Austria-Hungary (1867–1918). In 1910, Vienna had more than two million inhabitants, and was the fourth largest city in Europe after London, Paris and Berlin. Around the start of the 20th century, Vienna was the city with the second-largest Czech population in the world (after Prague). After World War I, many Czechs and Hungarians returned to their ancestral countries, resulting in a decline in the Viennese population. After World War II, the Soviets used force to repatriate key workers of Czech, Slovak and Hungarian origins to return to their ethnic homelands to further the Soviet bloc economy. Under the Nazi regime, 65,000 Jewish people were deported and murdered in concentration camps by Nazi forces; approximately 130,000 fled. By 2001, 16% of people living in Austria had nationalities other than Austrian, nearly half of whom were from former Yugoslavia; the next most numerous nationalities in Vienna were Turks (39,000; 2.5%), Poles (13,600; 0.9%) and Germans (12,700; 0.8%). As of 2012[update], an official report from Statistics Austria showed that more than 660,000 (38.8%) of the Viennese population have full or partial migrant background, mostly from Ex-Yugoslavia, Turkey, Germany, Poland, Romania and Hungary. From 2005 to 2015 the city's population grew by 10.1%. According to UN-Habitat, Vienna could be the fastest growing city out of 17 European metropolitan areas until 2025 with an increase of 4.65% of its population, compared to 2010. 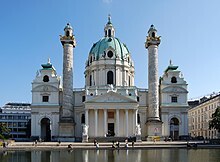 Vienna is the seat of the Metropolitan Roman Catholic Archdiocese of Vienna, in which is also vested the exempt Ordinariate for Byzantine-rite Catholics in Austria; its current Archbishop is Cardinal Christoph Schönborn. Many Roman Catholic churches in central Vienna feature performances of religious or other music, including masses sung to classical music and organ. Some of Vienna's most significant historical buildings are Roman Catholic churches, including the St. Stephen's Cathedral (Stephansdom), Karlskirche, Peterskirche and the Votivkirche. On the banks of the Danube, there is a Buddhist Peace Pagoda, built in 1983 by the monks and nuns of Nipponzan Myohoji. Vienna is located in northeastern Austria, at the easternmost extension of the Alps in the Vienna Basin. The earliest settlement, at the location of today's inner city, was south of the meandering Danube while the city now spans both sides of the river. Elevation ranges from 151 to 542 m (495 to 1,778 ft). The city has a total area of 414.65 square kilometres (160.1 sq mi), making it the largest city in Austria by area. Vienna has an oceanic climate bordering a humid subtropical climate (hovering just below 22 °C in July and August), and features, according to the Köppen classification, a Cfb (oceanic) -climate. The city has warm to hot summers, however with periodical precipitations that can reach its most in June and July and average high temperatures of 21 to 27 °C (70 to 81 °F), with a record maximum exceeding 38 °C (100 °F) and a record low of around 7 °C (45 °F). Winters are relatively dry and cold with average temperatures at about freezing point. Spring is variable and autumn usually cold, with possible snowfalls already in November. Precipitation is generally moderate throughout the year, averaging 550 mm (21.7 in) annually, with considerable local variations, the Vienna Woods region in the west being the wettest part (700 to 800 mm (28 to 31 in) annually) and the flat plains in the east being the driest part (500 to 550 mm (20 to 22 in) annually). Snow in the winter is common, even if rare compared to Western and Southern regions in Austria. Vienna has been moved to the UNESCO world heritage in danger list in 2017. The main reason is that Vienna is planning on having high-rise development. The city’s social democratic party will be constructing a 6500 square meter complex in 2019. It will include a 66.3m meter high-tower which has reduced from 75 meter due to opposition. The UNESCO believed that the project “fails to comply fully with previous committee decisions, notably concerning the height of new constructions, which will impact adversely the outstanding universal value of the site.”  UNESCO set the restriction for the height of the construction in the city center to be 43 meters. The citizens of Vienna are also opposing the construction of the complex because they are afraid of losing the UNESCO status and also encourage future high-rise development. The city officials replied that they will convince the WHC to maintain the UNESCO world heritage status and claimed that no further high-rise development are being planned. The reason why UNESCO is strict on the height of the Construction is that high rise development will dramatically influence the visual integrity of Vienna. The baroque palaces are highly sensitive to high-rise buildings. Visual impact studies are being done in Vienna city center to assess the level of visual disturbance to visitors and how the changes influenced the city’s visual integrity. Vienna is composed of 23 districts (Bezirke). Administrative district offices in Vienna (called Magistratische Bezirksämter) serve functions similar to those in the other Austrian states (called Bezirkshauptmannschaften), the officers being subject to the mayor of Vienna; with the notable exception of the police, which is under federal supervision. District residents in Vienna (Austrians as well as EU citizens with permanent residence here) elect a District Assembly (Bezirksvertretung). City hall has delegated maintenance budgets, e.g., for schools and parks, so that the districts are able to set priorities autonomously. Any decision of a district can be overridden by the city assembly (Gemeinderat) or the responsible city councillor (amtsführender Stadtrat). The heart and historical city of Vienna, a large part of today's Innere Stadt, was a fortress surrounded by fields in order to defend itself from potential attackers. In 1850, Vienna with the consent of the emperor annexed 34 surrounding villages, called Vorstädte, into the city limits (districts no. 2 to 8, after 1861 with the separation of Margareten from Wieden no. 2 to 9). Consequently, the walls were razed after 1857, making it possible for the city centre to expand. 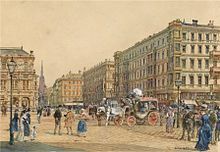 In their place, a broad boulevard called the Ringstraße was built, along which imposing public and private buildings, monuments, and parks were created by the start of the 20th century. 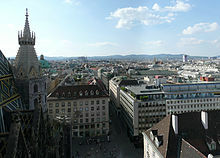 These buildings include the Rathaus (town hall), the Burgtheater, the University, the Parliament, the twin museums of natural history and fine art, and the Staatsoper. It is also the location of New Wing of the Hofburg, the former imperial palace, and the Imperial and Royal War Ministry finished in 1913. The mainly Gothic Stephansdom is located at the centre of the city, on Stephansplatz. The Imperial-Royal Government set up the Vienna City Renovation Fund (Wiener Stadterneuerungsfonds) and sold many building lots to private investors, thereby partly financing public construction works. From 1850 to 1890, city limits in the West and the South mainly followed another wall called Linienwall at which a road toll called the Liniengeld was charged. Outside this wall from 1873 onwards a ring road called Gürtel was built. In 1890 it was decided to integrate 33 suburbs (called Vororte) beyond that wall into Vienna by 1 January 1892 and transform them into districts no. 11 to 19 (district no. 10 had been constituted in 1874); hence the Linienwall was torn down beginning in 1894. In 1900, district no. 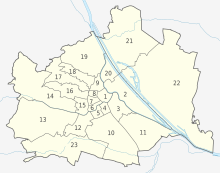 20, Brigittenau, was created by separating the area from the 2nd district. From 1850 to 1904, Vienna had expanded only on the right bank of the Danube, following the main branch before the regulation of 1868–1875, i.e., the Old Danube of today. In 1904, the 21st district was created by integrating Floridsdorf, Kagran, Stadlau, Hirschstetten, Aspern and other villages on the left bank of the Danube into Vienna, in 1910 Strebersdorf followed. On 15 October 1938 the Nazis created Great Vienna with 26 districts by merging 97 towns and villages into Vienna, 80 of which were returned to surrounding Lower Austria in 1954. Since then Vienna has 23 districts. Industries are located mostly in the southern and eastern districts. The Innere Stadt is situated away from the main flow of the Danube, but is bounded by the Donaukanal ("Danube canal"). Vienna's second and twentieth districts are located between the Donaukanal and the Danube River. Across the Danube, where the Vienna International Centre is located (districts 21–22), and in the southern areas (district 23) are the newest parts of the city. In the twenty years before the First World War and until 1918, Viennese politics were shaped by the Christian Social Party. In particular, long-term mayor Karl Lueger was able to not apply the general voting rights for men introduced by and for the parliament of imperial Austria, the Reichsrat, in 1907, thereby excluding most of the working class from taking part in decisions. For Adolf Hitler, who spent some years in Vienna, Lueger was a teacher of how to use antisemitism in politics. Vienna is today considered the center of the Social Democratic Party (SPÖ). During the period of the First Republic (1918–1934), the Vienna Social Democrats undertook many social reforms. At that time, Vienna's municipal policy was admired by Socialists throughout Europe, who therefore referred to the city as "Red Vienna" (Rotes Wien). In February 1934 troops of the Austrian federal government under Engelbert Dollfuss, who had closed down the first chamber of the federal parliament, the Nationalrat, in 1933, and paramilitary socialist organisations were engaged in the Austrian Civil War, which led to the ban of the Social Democratic party. The SPÖ has held the mayor's office and control of the city council/parliament at every free election since 1919. The only break in this SPÖ dominance came between 1934 and 1945, when the Social Democratic Party was illegal, mayors were appointed by the austro-fascist and later by the Nazi authorities. The current mayor of Vienna is Michael Ludwig of the SPÖ. The city has enacted many social democratic policies. The Gemeindebauten are social housing assets that are well integrated into the city architecture outside the first or "inner" district. The low rents enable comfortable accommodation and good access to the city amenities. Many of the projects were built after the Second World War on vacant lots that were destroyed by bombing during the war. The city took particular pride in building them to a high standard. Since Vienna obtained federal state (Bundesland) status of its own by the federal constitution of 1920, the city council also functions as the state parliament (Landtag), and the mayor (except 1934–1945) also doubles as the Landeshauptmann (governor/minister-president) of the state of Vienna. The Rathaus accommodates the offices of the mayor (de:Magistrat der Stadt Wien) and the state government (Landesregierung). The city is administered by a multitude of departments (Magistratsabteilungen), politically supervised by amtsführende Stadträte (members of the city government leading offices; according to the Vienna constitution opposition parties have the right to designate members of the city government not leading offices). Under the city constitution of 1920, municipal and state business must be kept separate. Hence, the city council and state parliament hold separate meetings, with separate presiding officers–the chairman of the city council or the president of the state Landtag–even though the two bodies' memberships are identical. When meeting as a city council, the deputies can only deal with the affairs of the city of Vienna; when meeting as a state parliament, they can only deal with the affairs of the state of Vienna. In the 1996 City Council election, the SPÖ lost its overall majority in the 100-seat chamber, winning 43 seats and 39.15% of the vote. The SPÖ had held an outright majority at every free municipal election since 1919. In 1996 the Freedom Party of Austria (FPÖ), which won 29 seats (up from 21 in 1991), beat the ÖVP into third place for the second time running. From 1996–2001, the SPÖ governed Vienna in a coalition with the ÖVP. In 2001 the SPÖ regained the overall majority with 52 seats and 46.91% of the vote; in October 2005 this majority was increased further to 55 seats (49.09%). In course of the 2010 city council elections the SPÖ lost their overall majority again and consequently forged a coalition with the Green Party – the first SPÖ/Green coalition in Austria. This coalition was maintained following the 2015 election. Vienna is one of the wealthiest regions in the European Union: Its gross regional product of EUR 47,200 per capita constituted 25.7% of Austria's GDP in 2013. It amounts to 159% of the EU average. The city improved its position from 2012 on the ranking of the most economically powerful cities reaching number nine on the listing in 2015. With a share of 85.5% in gross value added, the service sector is Vienna's most important economic sector. Industry and commerce have a share of 14.5% in gross value added, the primary sector (agriculture) has a share of 0.07% and therefore plays a minor role in the local added value. However, the cultivation and production of wines within the city borders have a high socio-cultural value. The most important business sectors are trade (14.7% of added value in Vienna), scientific and technological services, real estate and housing activities as well as manufacturing of goods. In 2012, Vienna's contribution in Austria's outgoing and incoming foreign direct investments was of about 60%, which demonstrates Vienna's role as an international hub for domestic and foreign companies. Since the fall of the Iron Curtain in 1989, Vienna has expanded its position as gateway to Eastern Europe: 300 international companies have their Eastern European headquarters in Vienna and its environs. Among them are Hewlett Packard, Henkel, Baxalta and Siemens. Companies in Vienna have extensive contacts and competences in business with Eastern Europe due to the city's historical role as centre of the Habsburg Empire. The number of international businesses in Vienna is still growing: In 2014 159 and in 2015 175 international firms established offices in Vienna. Altogether, approximately 8,300 new companies have been founded in Vienna every year since 2004. The majority of these companies are operating in fields of industry-oriented services, wholesale trade as well as information and communications technologies and new media. Vienna makes effort to establish itself as a start-up hub. Since 2012, the city hosts the annual Pioneers Festival, the largest start-up event in Central Europe with 2,500 international participants taking place at Hofburg Palace. Tech Cocktail, an online portal for the start-up scene, has ranked Vienna sixth among the top ten start-up cities worldwide. The city of Vienna attaches major importance to science and research and focuses on creating a positive environment for research and development. In 2014, Vienna has accommodated 1,329 research facilities; 40,400 persons are employed in the R&D sector and 35% of Austria's R&D expenses are invested in the city. With a research quota of 3.4% Vienna exceeds the Austrian average of 2.77% and has already met the EU target of 3.0% by 2020. A major R&D sector in Vienna are life sciences with 378 biotech, pharma and medtech companies such as Johnson & Johnson, Siemens, Roche, Philips and Boehringer Ingelheim, with more than 21,000 employees. There are 25 public and private research institutions, among them the University of Natural Resources and Life Sciences (BOKU), the Austrian Institute of Technology and the Vienna Biocenter. The Viennese sector for information and communication technologies is comparable in size with the sector in Helsinki, Milan or Munich and thus among Europe's largest IT locations. In 2012 8,962 IT businesses with a workforce of 64,223 were located in the Vienna Region. The main products are instruments and appliances for measuring, testing and navigation as well as electronic components. More than ⅔ of the enterprises provide IT services. Among the biggest IT firms in Vienna are Kapsch, Beko Engineering & Informatics, air traffic control experts Frequentis, Cisco Systems Austria, Hewlett-Packard, Microsoft Austria, IBM Austria and Samsung Electronics Austria. The US technology corporation Cisco runs its Entrepreneurs in Residence program for Europe in Vienna in cooperation with the Vienna Business Agency. The British company UBM has rated Vienna one of the Top 10 Internet Cities worldwide, by analysing criteria like connection speed, WiFi availability, innovation spirit and open government data. In 2011 74.3% of Viennese households were connected with broadband, 79% were in possession of a computer. According to the broadband strategy of the City, full broadband coverage will be reached by 2020. There were 14.96 million overnight stays in Vienna in 2016 (+4.4% compared to 2015). In 2014, 6.2 million tourists visited Vienna and amounted to 13,524,266 overnight stays. The main markets for tourists are Germany, the United States, Italy and Russia. Between 2005 and 2013, Vienna was the world's number one destination for international congresses and conventions. In 2014, 202 international conferences were held in Vienna, making it the second most popular congress location worldwide according to the statistics of the International Congress and Convention Association. Its largest conference centre, the Austria Center Vienna (ACV) has a total capacity for around 20,000 people and is situated next to the United Nations Headquarters in Vienna. Other centres are the Messe Wien Exhibition & Congress Center (up to 3,300 people) and the Hofburg Palace (up to 4,900 people). Regarding quality of living, Vienna leads the 2016 Quality of Living Ranking by the international Mercer Consulting Group for the seventh consecutive year. In the 2015 liveability report by the Economist Intellicence Unit as well as in the Quality of Life Survey 2015 of London-based Monocle magazine Vienna was equally ranked second most liveable city worldwide. The United Nations Human Settlements Programme UN-Habitat has ranked Vienna the most prosperous city in the world in its flagship report State of the World Cities 2012/2013. According to the 2014 City RepTrack ranking by the Reputation Institute, Vienna has the best reputation in comparison with 100 major global cities. The Innovation Cities Global Index 2014 by the Australian innovation agency 2thinknow ranks Vienna sixth behind San Francisco-San Jose, New York City, London, Boston and Paris. US climate strategist Boyd Cohen placed Vienna first in his first global smart cities ranking of 2012. In the 2014 ranking, Vienna reached third place among European cities behind Copenhagen and Amsterdam. The Mori Memorial Institute for Urban Strategies ranked Vienna in the top ten of their Global Power City Index 2016. Vienna's new Central Railway Station was opened in October 2014. Construction began in June 2007 and was due to last until December 2015. The station is served by 1,100 trains with 145,000 passengers. There is a shopping centre with approximately 90 shops and restaurants. In the vicinity of the station a new district is emerging with 550,000 m2 (5,920,000 sq ft) office space and 5,000 apartments until 2020. Seestadt Aspern is one of the largest urban expansion projects of Europe. A 5 hectare artificial lake, offices, apartments and a tube station within walking distance are supposed to attract 20,000 new citizens when construction is completed in 2028. In addition, the highest wooden skyscraper of the world called “HoHo Wien” will be built within 3 years, starting in 2015. In 2014, the Vienna City Council adopted the Smart City Wien Framework Strategy 2050. It is a long-term umbrella strategy that is supposed to establish a conducive, long-term and structural framework in order to reduce carbon dioxide emissions from 3.1 tonnes per capita to 1 tonne per capita by 2050, have 50% of Vienna's gross energy consumption originate from renewable sources and to reduce motorized individual traffic from the current 28% to 15% by 2030. A stated goal is that, by 2050, all vehicles within the municipal boundaries will run without conventional propulsion technologies. Additionally, Vienna aims to be one of the five biggest European research and innovation hubs in 2050. Musical luminaries including Wolfgang Amadeus Mozart, Joseph Haydn, Ludwig van Beethoven, Ferdinand Ries, Franz Schubert, Johannes Brahms, Gustav Mahler, Robert Stolz, and Arnold Schoenberg have worked there. Vienna is also home to a number of opera houses, including the Theater an der Wien, the Staatsoper and the Volksoper, the latter being devoted to the typical Viennese operetta. Classical concerts are performed at world-famous venues such as the Wiener Musikverein, home of the Vienna Philharmonic Orchestra known across the world for the annual widely broadcast "New Year's Day Concert", as well as the Wiener Konzerthaus, home of the internationally renowned Vienna Symphony. Many concert venues offer concerts aimed at tourists, featuring popular highlights of Viennese music, particularly the works of Wolfgang Amadeus Mozart, Johann Strauss I, and Johann Strauss II. Up until 2005, the Theater an der Wien has hosted premieres of musicals, although with the year of the Mozart celebrations 2006 it has devoted itself to the opera again and has since become a stagione opera house offering one new production each month, thus quickly becoming one of Europe's most interesting and advanced opera houses. Since 2012 Theater an der Wien has taken over the Wiener Kammeroper, a historical small theatre in the first district of Vienna seating 300 spectators, turning it into its second venue for smaller sized productions and chamber operas created by the young ensemble of Theater an der Wien (JET). Before 2005 the most successful musical was Elisabeth, which was later translated into several languages and performed all over the world. The Wiener Taschenoper is dedicated to stage music of the 20th and 21st century. The Haus der Musik ("house of music") opened in the year 2000. The Wienerlied is a unique song genre from Vienna. There are approximately 60,000 – 70,000 Wienerlieder. In 1981 the popular British new romantic group Ultravox paid a tribute to Vienna on an album and an artful music video recording called Vienna. The inspiration for this work arose from the cinema production called The Third Man with the title Zither music of Anton Karas. The Vienna's English Theatre (VET) is an English theater in Vienna. It was founded in 1963 and is located in the 8th Vienna's district. It is the oldest English-language theater in Europe outside the UK. In May 2015, Vienna hosted the Eurovision Song Contest following Austria's victory in the 2014 contest. Notable entertainers born in Vienna include Hedy Lamarr, Christoph Waltz, John Banner, Christiane Hörbiger, Eric Pohlmann, Christine Buchegger, Mischa Hausserman, Senta Berger and Christine Ostermayer. Notable musicians born in Vienna include Louie Austen, Alban Berg, Falco, Fritz Kreisler, Joseph Lanner, Arnold Schönberg, Franz Schubert, Johann Strauss I, Johann Strauss II, Anton Webern, and Joe Zawinul. Among the most notable Viennese Jews, some of whom left Austria before and during Nazi persecution, are the following figures: Sigmund Freud, Alfred Adler (who eventually converted to Christianity), Rudolf Dreikurs, Viktor Frankl, Fritz Lang, Peter Lorre, Fred Zinnemann (both of whose parents died in the Holocaust), Stefan Zweig, Simon Wiesenthal, Theodor Herzl, Judah Alkalai, Erich von Stroheim, Hedy Lamarr, Billy Wilder, Franz Werfel, Arnold Schoenberg and Fritz Kreisler. The Hofburg is the location of the Imperial Treasury (Schatzkammer), holding the imperial jewels of the Habsburg dynasty. The Sisi Museum (a museum devoted to Empress Elisabeth of Austria) allows visitors to view the imperial apartments as well as the silver cabinet. Directly opposite the Hofburg are the Kunsthistorisches Museum, which houses many paintings by old masters, ancient and classical artifacts, and the Naturhistorisches Museum. A number of museums are located in the Museumsquartier (museum quarter), the former Imperial Stalls which were converted into a museum complex in the 1990s. It houses the Museum of Modern Art, commonly known as the MUMOK (Ludwig Foundation), the Leopold Museum (featuring the largest collection of paintings in the world by Egon Schiele, as well as works by the Vienna Secession, Viennese Modernism and Austrian Expressionism), the AzW (museum of architecture), additional halls with feature exhibitions, and the Tanzquartier. The Liechtenstein Palace contains much of one of the world's largest private art collections, especially strong in the Baroque. Castle Belvedere, built under Prince Eugene, has a gallery containing paintings by Gustav Klimt (The Kiss), Egon Schiele, and other painters of the early 20th century, also sculptures by Franz Xaver Messerschmidt, and changing exhibitions too. There are a multitude of other museums in Vienna, including the Albertina, the Military History Museum, the Technical Museum, the Burial Museum, the Museum of Art Fakes, the KunstHausWien, Museum of Applied Arts, the Sigmund Freud Museum, and the Mozarthaus Vienna. The museums on the history of the city, including the former Historical Museum of the City of Vienna on Karlsplatz, the Hermesvilla, the residences and birthplaces of various composers, the Museum of the Romans, and the Vienna Clock Museum, are now gathered together under the group umbrella Vienna Museum. In addition there are museums dedicated to Vienna's individual districts. They provide a record of individual struggles, achievements and tragedy as the city grew and survived two world wars. For readers seeking family histories these are good sources of information. A variety of architectural styles can be found in Vienna, such as the Romanesque Ruprechtskirche and the Baroque Karlskirche. Styles range from classicist buildings to modern architecture. Art Nouveau left many architectural traces in Vienna. The Secession building, Karlsplatz Stadtbahn Station, and the Kirche am Steinhof by Otto Wagner rank among the best known examples of Art Nouveau in the world. Wagner's prominent student Jože Plečnik from Slovenia also left important traces in Vienna. His works include the Langer House (1900) and the Zacherlhaus (1903–1905). Plečnik's 1910–1913 Church of the Holy Spirit (Heilig-Geist-Kirche [de]) in Vienna is remarkable for its innovative use of poured-in-place concrete as both structure and exterior surface, and also for its abstracted classical form language. Most radical is the church's crypt, with its slender concrete columns and angular, cubist capitals and bases. Concurrent to the Art Nouveau movement was the Wiener Moderne, during which some architects shunned the use of extraneous adornment. A key architect of this period was Adolf Loos, whose works include the Looshaus (1909), the Kärntner Bar or American Bar (1908) and the Steiner House (1910). The Hundertwasserhaus by Friedensreich Hundertwasser, designed to counter the clinical look of modern architecture, is one of Vienna's most popular tourist attractions. Another example of unique architecture is the Wotrubakirche by sculptor Fritz Wotruba. In the 1990s, a number of quarters were adapted and extensive building projects were implemented in the areas around Donaustadt (north of the Danube) and Wienerberg (in southern Vienna). The 220-meter high DC Tower 1 located on the Northern bank of the Danube, completed in 2013, is the tallest skyscraper in Vienna. In recent years, Vienna has seen numerous architecture projects completed which combine modern architectural elements with old buildings, such as the remodelling and revitalisation of the old Gasometer in 2001. Most buildings in Vienna are relatively low; in early 2006 there were around 100 buildings higher than 40 metres (130 feet). The number of high-rise buildings is kept low by building legislation aimed at preserving green areas and districts designated as world cultural heritage. Strong rules apply to the planning, authorisation and construction of high-rise buildings. Consequently, much of the inner city is a high-rise free zone. Dancers and opera singers from the Vienna State Opera often perform at the openings of the larger balls. A Vienna ball is an all-night cultural attraction. Major Viennese balls generally begin at 9 pm and last until 5 am, although many guests carry on the celebrations into the next day. The Viennese balls are being exported with the support of the City of Vienna in around 30 cities worldwide such as New York, Barcelona, Hong Kong, Kuala Lumpur, Rome, Prague, Bucharest, Berlin and Moscow. Vienna is Austria's main centre of education and home to many universities, professional colleges and gymnasiums (high schools). Vienna possesses many parks, including the Stadtpark, the Burggarten, the Volksgarten (part of the Hofburg), the Schlosspark at Schloss Belvedere (home to the Vienna Botanic Gardens), the Donaupark, the Schönbrunner Schlosspark, the Prater, the Augarten, the Rathauspark, the Lainzer Tiergarten, the Dehnepark, the Resselpark, the Votivpark, the Kurpark Oberlaa, the Auer-Welsbach-Park and the Türkenschanzpark. Green areas include Laaer-Berg (including the Bohemian Prater) and the foothills of the Wienerwald, which reaches into the outer areas of the city. Small parks, known by the Viennese as Beserlparks, are everywhere in the inner city areas. Many of Vienna's famous parks include monuments, such as the Stadtpark with its statue of Johann Strauss II, and the gardens of the baroque palace, where the State Treaty was signed. Vienna's principal park is the Prater which is home to the Riesenrad, a Ferris wheel, and Kugelmugel, a micronation the shape of a sphere. The imperial Schönbrunn's grounds contain an 18th-century park which includes the world's oldest zoo, founded in 1752. The Donauinsel, part of Vienna's flood defences, is a 21.1 km (13.1 mi) long artificial island between the Danube and Neue Donau dedicated to leisure activities. Vienna hosts many different sporting events including the Vienna City Marathon, which attracts more than 10,000 participants every year and normally takes place in May. In 2005 the Ice Hockey World Championships took place in Austria and the final was played in Vienna. 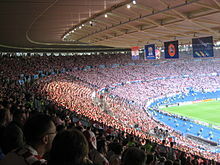 Vienna's Ernst Happel Stadium was the venue of four Champions League and European Champion Clubs' Cup finals (1964, 1987, 1990 and 1995) and on 29 June it hosted the final of Euro 2008 which saw a Spanish 1–0 victory over Germany. Tennis tournament Vienna Open also takes place in the city since 1974. The matches are played in the Wiener Stadthalle. The Neu Donau, which was formed after the Donauinsel was created is free of river traffic and has been referred to as an "autobahn for swimmers" due to its use by the public for commuting. Vienna is well known for Wiener Schnitzel, a cutlet of veal (Kalbsschnitzel) or pork (Schweinsschnitzel) that is pounded flat, coated in flour, egg and breadcrumbs, and fried in clarified butter. It is available in almost every restaurant that serves Viennese cuisine and can be eaten hot or cold. 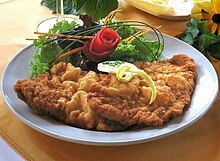 The traditional 'Wiener Schnitzel' though is a cutlet of veal. Other examples of Viennese cuisine include Tafelspitz (very lean boiled beef), which is traditionally served with Geröstete Erdäpfel (boiled potatoes mashed with a fork and subsequently fried) and horseradish sauce, Apfelkren (a mixture of horseradish, cream and apple) and Schnittlauchsauce (a chives sauce made with mayonnaise and stale bread). Vienna has a long tradition of producing cakes and desserts. These include Apfelstrudel (hot apple strudel), Milchrahmstrudel (milk-cream strudel), Palatschinken (sweet pancakes), and Knödel (dumplings) often filled with fruit such as apricots (Marillenknödel). Sachertorte, a delicately moist chocolate cake with apricot jam created by the Sacher Hotel, is world-famous. In winter, small street stands sell traditional Maroni (hot chestnuts) and potato fritters. Sausages are popular and available from street vendors (Würstelstand) throughout the day and into the night. The sausage known as Wiener (German for Viennese) in the U.S. and in Germany, is called a Frankfurter in Vienna. Other popular sausages are Burenwurst (a coarse beef and pork sausage, generally boiled), Käsekrainer (spicy pork with small chunks of cheese), and Bratwurst (a white pork sausage). Most can be ordered "mit Brot" (with bread) or as a "hot dog" (stuffed inside a long roll). Mustard is the traditional condiment and usually offered in two varieties: "süß" (sweet) or "scharf" (spicy). Kebab, pizza and noodles are, increasingly, the snack foods most widely available from small stands. The Naschmarkt is a permanent market for fruit, vegetables, spices, fish, meat, etc., from around the world. 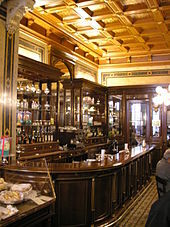 The city has many coffee and breakfast stores. Vienna, along with Paris, Santiago, Cape Town, Prague, Canberra, Bratislava and Warsaw, is one of the few remaining world capital cities with its own vineyards. The wine is served in small Viennese pubs known as Heuriger, which are especially numerous in the wine growing areas of Döbling (Grinzing, Neustift am Walde, Nußdorf, Salmannsdorf, Sievering), Floridsdorf (Stammersdorf, Strebersdorf), Liesing (Mauer) and Favoriten (Oberlaa). The wine is often drunk as a Spritzer ("G'spritzter") with sparkling water. The Grüner Veltliner, a dry white wine, is the most widely cultivated wine in Austria. Also, local soft drinks such as Almdudler are very popular around the country as an alternative to alcoholic beverages, placing it on the top spots along American counterparts such as Coca-Cola in terms of market share. Another popular drink is the so-called "Spezi", a mix between Coca-Cola and the original formula of Orange Fanta or the more locally renowned Frucade. Viennese cafés have an extremely long and distinguished history that dates back centuries, and the caffeine addictions of some famous historical patrons of the oldest are something of a local legend. These coffee houses are unique to Vienna and many cities have unsuccessfully sought to copy them. Some people consider cafés as their extended living room where nobody will be bothered if they spend hours reading a newspaper while enjoying their coffee. Traditionally, the coffee comes with a glass of water. Viennese cafés claim to have invented the process of filtering coffee from booty captured after the second Turkish siege in 1683. Viennese cafés claim that when the invading Turks left Vienna, they abandoned hundreds of sacks of coffee beans. The Polish King John III Sobieski, the commander of the anti-Turkish coalition of Poles, Germans, and Austrians, gave Franz George Kolschitzky (Polish – Franciszek Jerzy Kulczycki) some of this coffee as a reward for providing information that allowed him to defeat the Turks. Kolschitzky then opened Vienna's first coffee shop. Julius Meinl set up a modern roasting plant in the same premises where the coffee sacks were found, in 1891. Major tourist attractions include the imperial palaces of the Hofburg and Schönbrunn (also home to the world's oldest zoo, Tiergarten Schönbrunn) and the Riesenrad in the Prater. Cultural highlights include the Burgtheater, the Wiener Staatsoper, the Lipizzaner horses at the spanische Hofreitschule, and the Vienna Boys' Choir, as well as excursions to Vienna's Heurigen district Döbling. There are also more than 100 art museums, which together attract over eight million visitors per year. 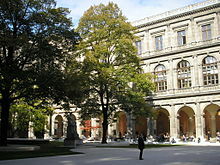 The most popular ones are Albertina, Belvedere, Leopold Museum in the Museumsquartier, KunstHausWien, Bank Austria Kunstforum, the twin Kunsthistorisches Museum and Naturhistorisches Museum, and the Technisches Museum Wien, each of which receives over a quarter of a million visitors per year. 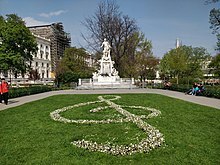 There are many popular sites associated with composers who lived in Vienna including Beethoven's various residences and grave at Zentralfriedhof (Central Cemetery) which is the largest cemetery in Vienna and the burial site of many famous people. Mozart has a memorial grave at the Habsburg gardens and at St. Marx cemetery (where his grave was lost). Vienna's many churches also draw large crowds, famous of which are St. Stephen's Cathedral, the Deutschordenskirche, the Jesuitenkirche, the Karlskirche, the Peterskirche, Maria am Gestade, the Minoritenkirche, the Ruprechtskirche, the Schottenkirche, St. Ulrich and the Votivkirche. Vienna has an extensive transportation network with a unified fare system that integrates municipal, regional and railway systems under the umbrella of the Verkehrsverbund Ost-Region (VOR). Public transport is provided by buses, trams and 5 underground metro lines (U-Bahn), most operated by the Wiener Linien. There are also more than 50 S-train stations within the city limits. Suburban trains are operated by the ÖBB. The city forms the hub of the Austrian railway system, with services to all parts of the country and abroad. The railway system connects Vienna with other European cities, like Munich, Venice, Budapest, Prague, Bratislava and Zürich. Vienna has multiple road connections including motorways. Vienna is served by Vienna International Airport, located 18 km (11 mi) southeast of the city centre next to the town of Schwechat. The airport handled approximately 24.4 million passengers in 2017. Following lengthy negotiations with surrounding communities, the airport will be expanded to increase its capacity by adding a third runway. The airport is currently undergoing a major expansion, including a new terminal building that opened in 2012 to prepare for an expected increase in passengers. Vienna is the seat of a number of United Nations offices and various international institutions and companies, including the International Atomic Energy Agency (IAEA), the United Nations Industrial Development Organization (UNIDO), the United Nations Office on Drugs and Crime (UNODC), the Organization of Petroleum Exporting Countries (OPEC), the OPEC Fund for International Development (OFID), the Preparatory Commission for the Comprehensive Nuclear-Test-Ban Treaty Organization (CTBTO), the Organization for Security and Co-operation in Europe (OSCE), the United Nations Office for Outer Space Affairs (UNOOSA) and the European Union Agency for Fundamental Rights (FRA). Currently Vienna is the world's third "UN city", next to New York, Geneva, and Nairobi. Additionally, Vienna is the seat of the United Nations Commission on International Trade Law's secretariat (UNCITRAL). In conjunction, the University of Vienna annually hosts the prestigious Willem C. Vis Moot, an international commercial arbitration competition for students of law from around the world. Various special diplomatic meetings have been held in Vienna in the latter half of the 20th century, resulting in various documents bearing the name Vienna Convention or Vienna Document. Among the more important documents negotiated in Vienna are the 1969 Vienna Convention on the Law of Treaties, as well as the 1990 Treaty on Conventional Armed Forces in Europe. Vienna also hosted the negotiations leading to the 2015 Joint Comprehensive Plan of Action on Iran's nuclear program as well as the Vienna peace talks for Syria. Vienna also headquartered the International Taekwon-Do Federation (ITF). Alongside international and intergovernmental organisations, there are dozens of charitable organisations based in Vienna. One such organisation is the network of SOS Children's Villages, founded by Hermann Gmeiner in 1949. Today, SOS Children's Villages are active in 132 countries and territories worldwide. Others include HASCO. Another extremely popular international event is the annual Life Ball, which supports people with HIV or AIDS. Guests such as Bill Clinton and Whoopi Goldberg were recent attendees. The general policy of the City of Vienna is not to sign any twin or sister city agreements with other cities. Instead Vienna has only cooperation agreements in which specific cooperation areas are defined. In addition, individual Viennese districts have international partnerships all over the world. A detailed list can be found on the following webpage of the City of Vienna. ^ a b c STATISTIK AUSTRIA. "Bevölkerung zu Jahres-/Quartalsanfang". statistik.at. Retrieved 2016-02-12. ^ a b "Vienna in figures 2012, Vienna City Administration Municipal Department 23 Economic history, Labour and Statistics Responsible for the contents: Gustav Lebhart, page 6" (PDF). Archived from the original (PDF) on 18 October 2012. Retrieved 21 September 2012. ^ "Statistik Austria – Bevölkerung zu Quartalsbeginn seit 2002 nach Bundesland". Statistik.at. 14 February 2013. Retrieved 22 May 2013. ^ a b "VCÖ.at: VCÖ fordert Nahverkehrsoffensive gegen Verkehrskollaps in den Städten". vcoe.at. 2008. Archived from the original on 6 July 2011. Retrieved 5 August 2009. ^ "Postlexikon". Post AG. 2018. Retrieved 2 June 2018. ^ "Ergebnisse Zensus 2011" (in German). Statistische Ämter des Bundes und der Länder. 31 May 2013. Retrieved 31 May 2013. ^ "Historic Centre of Vienna". UNESCO. Retrieved 2017-07-12. ^ "Vienna – the City of Music – VIENNA – NOW OR NEVER". Wien.info. Retrieved 19 May 2012. ^ "Historic Centre of Vienna". UNESCO World Heritage Centre. Retrieved 19 May 2012. ^ "The world's most 'liveable' cities 2015". Retrieved 20 August 2015. ^ "The world's most 'liveable' cities 2014" (PDF). Retrieved 20 August 2015. ^ "The world's most liveable cities 2013". Retrieved 20 August 2015. ^ "The world's most 'liveable' cities 2012". Retrieved 20 August 2015. ^ "The world's most 'liveable' cities 2011". Retrieved 20 August 2015. ^ "The world's most liveable city named". BBC News. 2018-08-14. Retrieved 2018-08-14. ^ "Mercer 2015 Quality of Living Rankings". ^ "2014 Quality of Living survey". mercer.com. ^ "Mercer press release: Quality of Living global city rankings—2009". Archived from the original on 23 January 2011. Retrieved 2 December 2011. ^ "Mercer Quality of LIfe Worldwide City Rankings, 2010 from resourceshelf.com". Archived from the original on 4 December 2011. Retrieved 2 December 2011. ^ Inocencio, Ramy (4 December 2012). "What city has world's best quality of life?". CNN. ^ "Mercer | Quality of Living Ranking 2016". www.mercer.com. Archived from the original on 11 November 2016. Retrieved 22 November 2016. ^ Monocle. "Quality of Live Survey 2015". Monocle. Retrieved 24 June 2015. Monocle's 2012 "Quality of Life Survey" ranked Vienna fourth on a list of the top 25 cities in the world "to make a base within" (up from sixth in 2011 and eighth in 2010). ^ "Monocle's top 25 cities for 2011, on businessinsider.com". Retrieved 2 December 2011. ^ "Monocle's 2011 "Quality of LIfe" summary". Retrieved 3 December 2011. ^ "08 Vienna". Monocle.com. 15 June 2010. Archived from the original on 7 May 2012. Retrieved 19 May 2012. ^ "State of the World's Cities 2012/2013". Retrieved 25 August 2015. ^ "2thinknow Innovation Cities Global 256 Index – worldwide innovation city rankings: Innovation Cities Program". Innovation-cities.com. 2007. Retrieved 20 August 2015. ^ "2thinknow Innovation Cities Global 256 Index – worldwide innovation city rankings: Innovation Cities Program". Innovation-cities.com. 2008. Retrieved 20 August 2015. ^ "2thinknow Innovation Cities Global 256 Index – worldwide innovation city rankings: Innovation Cities Program". Innovation-cities.com. 2014. Retrieved 20 August 2015. ^ "Vienna knows how". wieninternational.at. 15 April 2010. Archived from the original on 15 September 2010. Retrieved 3 January 2011. ^ "Vienna is the world's number one congress destination". wieninternational.at. 1 June 2011. Archived from the original on 21 August 2011. Retrieved 15 October 2011. ^ "Vienna Tourist Board: Arrivals & bednights 2016". Retrieved 2016-04-09. ^ Peter Csendes: Das Werden Wiens – Die siedlungsgeschichtlichen Grundlagen, in: id. and F. Oppl (edd. ): Wien – Geschichte einer Stadt von den Anfängen zur Ersten Türkenbelagerung. Böhlau, Vienna 2001, pp. 55–94, here p. 57; Peter Pleyel: Das römische Österreich. Pichler, Vienna 2002, ISBN 3-85431-270-9, p. 83; Martin Mosser and Karin Fischer-Ausserer (edd. ): Judenplatz. Die Kasernen des römischen Legionslagers. (= Wien Archäologisch. Band 5). Museen der Stadt Wien – Stadtarchäologie, Vienna 2008, p. 11. ^ Article Vienna in Online Etymology Dictionary. Retrieved 18 May 2016. ^ Johanna Haberl: Favianis, Vindobona und Wien, eine archäologisch-historische Illustration zur Vita S. Severini des Eugippius. Brill Academic, Leiden 1976, ISBN 9004-04548-1, p. 125. ^ Chisholm, Hugh, ed. (1911). "Vienna" . Encyclopædia Britannica. 28 (11th ed.). Cambridge University Press. p. 52. ^ Lingelbach, William E. (1913). The History of Nations: Austria-Hungary. New York: P. F. Collier & Son Company. pp. 91–92. ASIN B000L3E368. ^ Spielman, John Philip (1993). The city & the crown: Vienna and the imperial court, 1600–1740. West Lafayette, Indiana: Purdue University Press. p. 141. ISBN 1-55753-021-1. ^ "1913: When Hitler, Trotsky, Tito, Freud and Stalin all lived in the same place". BBC News. 18 April 2013. Retrieved 11 November 2013. Freud's favourite haunt, the Cafe Landtmann, still stands on the Ring, the renowned boulevard which surrounds the city's historic Innere Stadt. Trotsky and Hitler frequented Cafe Central, just a few minutes' stroll away, where cakes, newspapers, chess and, above all, talk, were the patrons' passions. ^ Erlanger, Steven (7 March 2002). "Vienna Skewered as a Nazi-Era Pillager of Its Jews". The New York Times. The New York Times. Retrieved 11 May 2017. ^ Dr. Ingeborg Bauer-Manhart (Municipal Department 53). "Expulsion, Deportation to concentration camps and mass murder - History of the Jews in Vienna From racist mania to genocide". WIEN AT. Retrieved 11 May 2017. ^ "HC Deb 30 June 1948 vol 452 cc2213-49". Historic Hansard. UK Parliament. Retrieved 17 February 2016. ^ "Statistisches Jahrbuch der Stadt Wien 2014". Stadt Wien. Archived from the original on 2 February 2015. Retrieved 31 January 2015. ^ Porter, Darwin; Prince, Danforth (2009). Frommer's Vienna & the Danube Valley. John Wiley & Sons. p. 16. ^ "Czech and Slovak roots in Vienna". Wieninternational.at. Archived from the original on 12 May 2014. Retrieved 19 May 2012. ^ "Vienna". Jewishvirtuallibrary.org. Retrieved 19 May 2012. ^ "Bevölkerung 2001 nach Umgangssprache, Staatsangehörigkeit und Geburtsland" (PDF). Retrieved 19 May 2012. ^ "Beč: Božić na gastarbajterski način | Evropa | Deutsche Welle | 7 January 2010". Deutsche Welle. Retrieved 22 January 2010. ^ "Vienna in figures" (PDF). Archived from the original (PDF) on 1 May 2015. Retrieved 21 August 2015. ^ "City population by country" (PDF). UN-Habitat. Archived from the original (PDF) on 25 September 2015. Retrieved 21 August 2015. ^ "Wien: Anteil der Katholiken seit 1970ern halbiert". DiePresse.com. Retrieved 2016-02-12. ^ "Klimadaten von Österreich 1971–2000 – Wien-Innere-Stadt" (in German). Central Institute for Meteorology and Geodynamics. Retrieved 16 February 2015. ^ a b c d e f g Soo Kim, Travel writer. "Vienna's World Heritage status under threat over plans to build 66-metre tower". The Telegraph. Retrieved 2018-12-09. ^ "Pakt unterzeichnet: Rot-Grün in Wien nun offiziell – news.ORF.at". Orf.at. 15 November 2010. Retrieved 3 January 2011. ^ "GDP per capita in the EU in 2013". Eurostat. 21 May 2015. Retrieved 12 October 2015. ^ "The 25 Most Economically Powerful Cities in the World". CityLab. 15 September 2011. Retrieved 26 June 2016. ^ "Sorry, London: New York Is the World's Most Economically Powerful City". CityLab. 3 March 2015. Retrieved 26 June 2016. ^ a b c "Statistik Journal Wien" (PDF). 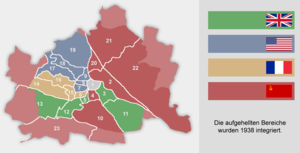 Magistrat der Stadt Wien MA 23 – Wirtschaft, Arbeit und Statistik. March 2014. Retrieved 13 October 2015. ^ "Headquarters Location Austria" (PDF). Austrian Business Agency. December 2014. Retrieved 13 October 2015. ^ "Vienna as hub for Eastern and South-Eastern Europe". Vienna City Administration. Archived from the original on 8 December 2015. Retrieved 13 October 2015. ^ "Wieder Rekordergebnis bei Betriebsansiedlungen" (in German). Vienna City Administration. Retrieved 21 August 2016. ^ "Unternehmensgründungen nach Bundesländern" (PDF) (in German). Austrian Chamber of Commerce. July 2015. Archived from the original (PDF) on 4 March 2016. Retrieved 13 October 2015. ^ "Volkswirtschaft – Statistiken" (in German). Vienna City Administration. Retrieved 13 October 2015. ^ "Vienna among top ten start-up cities worldwide". Vienna City Administration. Archived from the original on 1 June 2016. Retrieved 13 October 2015. ^ "Pioneers Festival". JFDI GmbH. Archived from the original on 15 October 2015. Retrieved 13 October 2015. ^ "Top 10 Startup Cities Where Entrepreneurs Want to Meet Up". Tech.Co. 2 February 2015. Retrieved 13 October 2015. ^ "Vienna Life Science Report" (PDF). LISA vienna. Archived from the original (PDF) on 4 March 2016. Retrieved 13 October 2015. ^ a b Vienna Digital City (PDF). Vienna City Administration Municipal Department 23 Economic Affairs, Labour and Statistic. March 2015. ISBN 978-3-901945-17-5. Retrieved 13 October 2015. ^ a b "IKT Standort Wien im Vergleich Endbericht" (PDF) (in German). KMU FORSCHUNG AUSTRIA and Fraunhofer-Gesellschaft. December 2007. Retrieved 13 October 2015. ^ "International start-ups in Vienna". Vienna Business Agency. Archived from the original on 16 February 2016. Retrieved 13 October 2015. ^ "Cisco Entrepreneurs in Residence". Cisco Systems. Archived from the original on 9 October 2015. Retrieved 13 October 2015. ^ "Discover the World's Greatest Internet Cities". UBM LLC. 26 August 2013. Retrieved 13 October 2015. ^ "2016 brought new high in overnight stays for Vienna". City of Vienna. ^ "Vienna in Figures 2015" (PDF). Vienna City Administration. July 2015. Archived from the original (PDF) on 4 March 2016. Retrieved 13 October 2015. ^ "Tourismus – Statistiken" (in German). Vienna City Administration. Retrieved 13 October 2015. ^ "Vienna's performance in international competition". Vienna City Administration. Archived from the original on 3 April 2015. Retrieved 13 October 2015. ^ "ICCA most popular cities for association meetings". International Congress and Convention Association. 15 June 2015. Retrieved 13 October 2015. ^ "Austria Center Vienna". Austria Center Vienna. Retrieved 13 October 2015. ^ "Vienna tops latest Quality of Living rankings". Mercer. 4 March 2015. Retrieved 13 October 2015. ^ "The world's most liveable cities". The Economist. 18 August 2015. Retrieved 13 October 2015. ^ "The Monocle Quality of Life Survey 2015". Monocle. Retrieved 13 October 2015. ^ "state of the world's cities" (PDF). UN Habitat. Retrieved 15 October 2015. ^ "Most Reputable Cities in the World". Reputation Institute. 2014. Archived from the original on 5 October 2015. Retrieved 15 October 2015. ^ "Innovation Cities Index 2014". 2thinknow. 2014. Retrieved 15 October 2015. ^ "The 10 Smartest Cities In Europe". Boyd Cohen. Retrieved 15 October 2015. ^ UK, DVV Media. "Wien Hauptbahnhof officially inaugurated". Retrieved 2016-08-16. ^ "Central Station". City of Vienna. Retrieved 21 August 2015. ^ "Der Wiener Hauptbahnhof ist eröffnet, zumindest offiziell". DerStandard. Retrieved 21 August 2015. ^ "Moving Vienna Main Railway Station" (PDF). ÖBB. Archived from the original (PDF) on 24 September 2015. Retrieved 28 August 2015. ^ "Das Projekt – aspern Seestadt". City of Vienna. Retrieved 21 August 2015. ^ "Seestadt Aspern: "Täglich etwas Neues"". ORF. Retrieved 21 August 2015. ^ "Weltweit erstes 24-stöckiges Holzhochhaus in Aspern Seestadt". City of Vienna. Retrieved 21 August 2015. ^ "Framework Strategy 2050". City of Vienna. Retrieved 25 August 2015. ^ "Wiener Volksliederwerk, ''Zum Wienerlied''". Wvlw.at. Retrieved 19 May 2012. ^ "Vienna's 10 tallest skyscrapers". Skyscraperpicture.com. 13 May 2008. Archived from the original on 30 November 2010. Retrieved 13 June 2010. ^ "Millennium Tower | Buildings". Vienna /: Emporis. Retrieved 19 May 2012. ^ a b Vienna Tourist Board. "Balls in Vienna". Archived from the original on 6 September 2015. Retrieved 21 August 2015. ^ City of Vienna. "International activities of the City of Vienna". Archived from the original on 11 March 2016. Retrieved 21 August 2015. ^ City of Vienna. "Viennese balls abroad". Archived from the original on 12 April 2015. Retrieved 21 August 2015. ^ "VIENNA'S AUTOBAHN FOR SWIMMERS". Retrieved 2018-01-04. ^ "Gruner Veltliner Wine". Wine-Searcher. ^ "Vienna in figures: Special Issue for the EU Presidency 2006" (PDF). City of Vienna. p. 10. Archived from the original (PDF) on 16 December 2011. Retrieved 23 September 2011. ^ "FWAG (group) facts & figures". www.viennaairport.com. Vienna International Airport. Retrieved 10 March 2019. ^ "District-to-district partnerships of the City of Vienna". Vienna City Administration. Archived from the original on 4 March 2016. Retrieved 20 October 2015. Pippal, M.: A short History of Art in Vienna, Munich: C.H. Beck 2000, ISBN 978-3-406-46789-9, provides a concise overview. Dassanowsky, Robert ed, : "World Film Locations: Vienna", London: Intellect/Chicago: U of Chicago Press, 2012, ISBN 978-1-84150-569-5. International films about Vienna or Austria shot on location throughout cinema history.